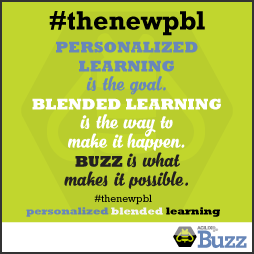 Buzz can help you increasingly personalize your students' learning experience. Personalized learning is an educational standard (and some would say process, as in personalizing learning) to which many teaching models aspire. Providing a personalized learning experience entails using each student's performance, potential (abilities and competencies), and interests to adapt instructional pace and approach to best meet their needs, while giving them an appropriate amount of control over their educational experience and direction. This sort of environment often requires a teacher who functions as more of a facilitator and evaluator, promoting self-guided progress and a flexible environment. Given the realities of today's educational system, creating a truly personalized learning experience in a classroom setting can be something of a tall order, seemingly asking educators to meet the superhuman goal of yielding one-on-one-tutor type results with 20+ students at once. With an ever-evolving design committed to empowering educators and students, however, Buzz can help you increasingly personalize your students' learning experience. Self Assessment: The Self Assessment feature lets students evaluate their personal understanding, interest, and effort in a course using a simple four-point scale for each. This is a low-risk and easy way for students to communicate with their teacher, and teachers can use the results to guide intervention and personalized attention. Objective Mastery: Buzz allows you to import educational standards (e.g., federal, state, district), align them with activities, and track and review how each student performs against them. Teachers can easily access this information and respond to student's needs in personalized ways. Formative and remediation assessments: Buzz's formative and remediation assessments help identify each student's needs and provide personalized learning opportunities to meet those needs. Formative assessments: When students demonstrate objective mastery on a formative assessment, Buzz automatically lets them skip activities meant to teach those objectives so they can focus on material they haven't yet mastered. Remediation assessments: Remediation assessments also evaluate performance against objectives, and, if a student shows lack of mastery, Buzz identifies activities that were meant to teach those objectives and encourages the student to return to them. Clipboard intervention: Use the Clipboard to quickly provide personalized attention to students. It is always available in the toolbar and you can assign activities, award badges, assign tasks, and message students quickly and easily based on their needs. This is an easy way to adapt on the fly; you can even sit with a student, discuss what they are trying to accomplish, and develop and assign next steps and tasks right in Buzz with them. Groups: Buzz lets you easily divide your classes into multiple and overlapping group sets. Once you've created groups, you can send messages, assign activities, create quick intervention tasks, assign grades, and award badges to the whole group or to individuals. Being able to easily create and manage groups give you just one more approach to meeting your students' needs. Activity types: Buzz provides a variety of activity types. You can create Wikis and Discussion threads to promote collaborative knowledge creation and idea exchange, Journals and Blogs for personal reflection, as well as more traditional assignments and assessments. Project-based learning (PBL) activity templates: This template let's you create a project; assign project groups; and integrate multiple activity types, like Discussions, Blogs, Wikis, and Journals all in one place. The Project template makes it easy implement a PBL approach in your personalized classroom. Student choice: Choice activities in Buzz enable students to review a teacher-curated selection of activities and choose to complete the ones that best align with their personal interests and goals. Self-assigned tasks: Students can create and self-assign activities that are integrated into their calendars. Creating and completing self-assigned tasks helps students explore material, manage their time, and direct their own learning path. Digital Library: Expand and diversify the content students can explore with various online resources in the Digital Library to increase the chances that they can find content and activities that meet their needs and interests. Badges: Badges are rapidly becoming a standard way for teachers to reward achievement, reinforce behavior, and verify competency. When used meaningfully, badges can be important motivators that benefit students beyond your course and help them shape their path. They can upload badges to external badge managers and shape their collection to reflect their interests and highlight their strengths. Customization: It may seem like a small thing, but giving students control over the look and feel of their virtual learning space can enhance their experience and connection with the tool. Buzz allows students to choose color, background images, avatars, and select display features to help them make Buzz their own. Who's doing work in personalized learning? School Improvement Network: "Everything we do helps leaders create personalized learning opportunities for their educators, resulting in improved teacher effectiveness and dramatically higher student achievement." Weber Innovation High School: "The Mission of Weber Innovation High School is to personalize student opportunities and to accelerate mastery in pursuit of college and career readiness." Edutopia: "We are focused on practices and programs that help students acquire and effectively apply the knowledge, attitudes, skills and beliefs to achieve their full potential." New Classrooms: "We design personalized instructional model that help teachers personalize learning to the needs of each student." Currently it does not have an integration, but the badges can be downloaded and uploaded into an external badge manager. This is because of open standards for badges. See the following document How do I download my badges? for steps to download. Thanks for this article! Does Buzz integrate (or otherwise work with) any specific badge managers? How do I customize my domain's brand, styles, and themes?